Bonnie Raitt in Montreal or Quebec City? Inform me about the next events for Bonnie Raitt. Enroll yourself to our priority waiting list for Bonnie Raitt to be alerted when new tickets are available. Filling this form doesn't engage you to any purchase. 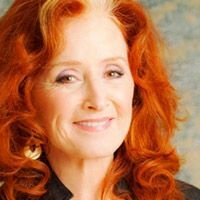 Bonnie Raitt will be performing at the Montreal Olympia on May 31st, 2017. This will be a rare occasion for Bonnie Raitt fans to see her perform in Montreal, as she rarely visits the province of Quebec. Her last presence here goes back to 2013. At 68, Bonnie Raitt is still touring and producing albums, after over 40 years of career. Her latest album, Dig In Deep, was released in 2016. James “Hutch” Hutchinson (bass), Ricky Fataar (percussions), Georges Marinelli (guitar) and Mike Finnigan (keys) will accompagnying the famous singer. Don't miss living legend Bonnie Raitt when she comes to Montreal !